Looking for Great Wedding Bands Cork? Why not choose The Jukebox Kings Wedding Band? We are an Energetic and Lively Wedding Band who provide Entertainment in Cork on a regular basis. We Love to visit the Rebel County and the Peoples Republic to spend time on the Banks of the Lovely Lee. If you request it we might even throw in a Rendition of “The Banks of My Own Lovely Lee”. Cork, of course, is like a second home to me as my Grandmother was a Bantry Lady who shared many a tale of growing up on the Bay. Our Drummers favourite tipple is Murphy’s Stout and he tells me there is nowhere better to get a good Pint of the Black stuff than in Callanan’s on George’s Quay. We are available for bookings in Cork City, Cork County and on a nationwide basis. The Band was Established in 2008 as the Jukebox Kings Wedding Band. The Jukebox Kings work hard to create and maintain an excellent reputation in a highly competitive industry. We provide a wide range of music, for every occasion. We perform on a regular basis in many of the top Hotels and Wedding Venues throughout Cork. Our music is styled to accommodate all tastes and age groups. We have the ability to adapt and change musical styles to suit any occasion. 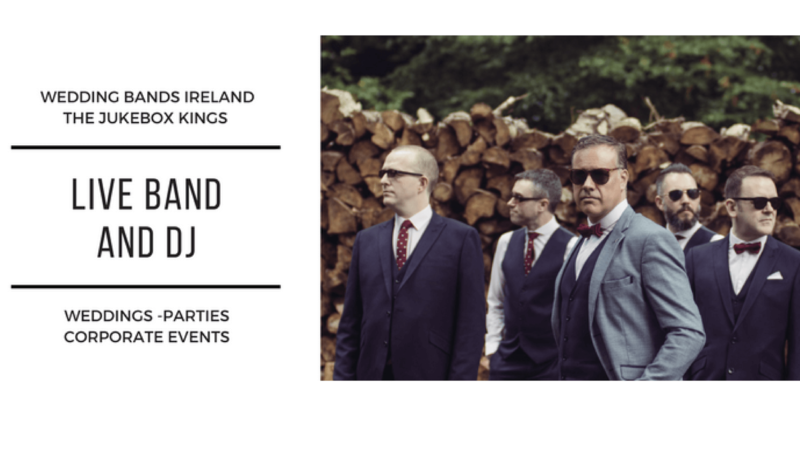 The Jukebox Kings Wedding Band Ireland.